John Wall comes up big with two pull up jumpers in overtime as the Wizards hang on to beat the feisty Brooklyn Nets, 119-113. All five Wizards starters plus Kelly Oubre scored in double figures led by Bradley Beal with 24 while John Wall wasn’t far behind with 23 points. Washington raced out to an early lead and led by as many as 23, 57-34, midway through the second quarter in what looked like might be an easy victory. However, an easy victory for this team would be way too off-brand. Overtime aside, the Nets outscored the Wizards 68-48 as Washington forgot that they play two halves in the game of basketball. With just seconds remaining, Spencer Dinwiddie missed a three-pointer however the ball was tipped back to Quincy Acy who knocked down the three-pointer tying the game at 107 as we’d go to overtime. John Wall took over in the overtime period assisting Gortat for a floater in the lane to get things started and finding Bradley Beal on consecutive possessions for open jumpers as the Wizards took a 114-109 lead. Wall would later ice the game with two midrange jumpers as Washington hangs on in a nail-biter, 119-113. You hold your breath every time the Wizards play a sub .500 team because you’re not quite sure how they’re going to come out to play. However, Brooklyn is a different type of team. Their record wouldn’t indicate it but they have some nice young talent on their squad, make all of the hustle plays, and are never out of a game as they shoot a ton of three-pointers. The Nets went 6-12 from three-point range in the fourth quarter to erase the deficit and probably would have come up with the win if not for a slow start and a couple of errant plays late in the game. As mentioned, Washington held a 20-point lead for the majority of the first half but forgot to come out of the locker room tunnel in the second half. Lazy plays on defense, not boxing out, and nine second-half turnovers allowed Brooklyn to fight back in this one. For the second time in as many nights, they barely beat a team that they were clearly better than. They have obviously not learned their lesson yet that playing down to your level of competition can come back to haunt you. Marcin Gortat was terrific tonight scoring 16 points to go along with 13 rebounds on Polish Heritage Night. The Polish Hammer started the night 4-4 from the field and was grabbing every rebound in sight. In the overtime period, he knocked down his first jumper in the lane and set many terrific screens to get Beal wide open on the wing for good looks. Gortat’s hot start and consistent play down the stretch was one of the main reasons Washington was able to sneak out with a victory. 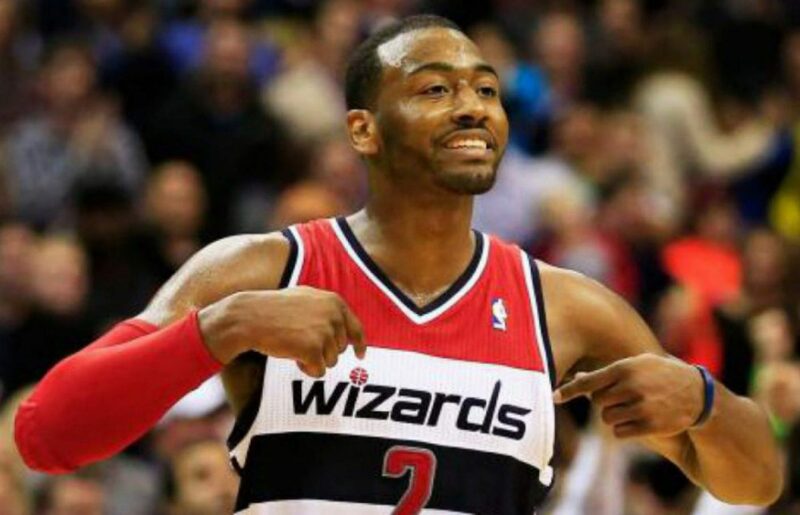 Wall and Beal combined to score nine of the Wizards 12 overtime points as they pulled away in the extra period. Wall found Beal on the wing who shook free for an open look that he buried. Next time down, Wall found Beal again, this time for three and he buried that too stretching the Wizards lead to five, 114-109. After two Jarrett Allen free throws, John Wall got to his elbow and knocked down a nice jumper. The next time down, he crossed over, this time knocking down the jumper over Allen Crabbe to ice the game. It would have been nice if this game never went into overtime, however; Washington’s two biggest stars came up big when it mattered most. Next Up: Washington hosts Milwaukee on MLK Day Monday afternoon in their final game of this homestand.